Who knew infinity could be so beautiful? I’ve returned with Part II of the Digitopolis event post (Part I can be found here) and thought I would start it off with one of the stars of the show! 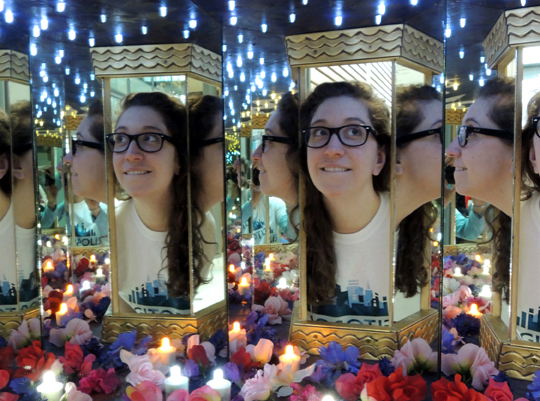 The above image was taken inside an Infinity Box, one of multiple creations by Los Angeles-based artist, Matt Elson. 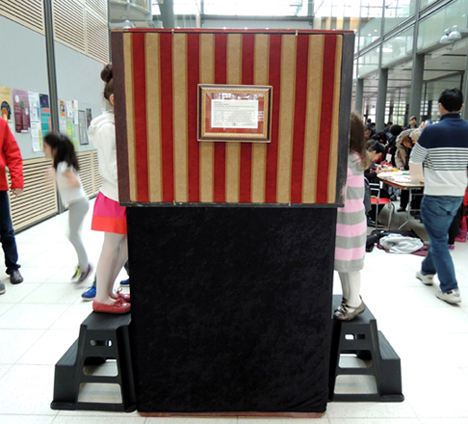 Matt’s boxes have been exhibited at colleges, science centers, festivals, and museums. He generously loaned us two (titled Radiance, and You & Me Together) for our math event. 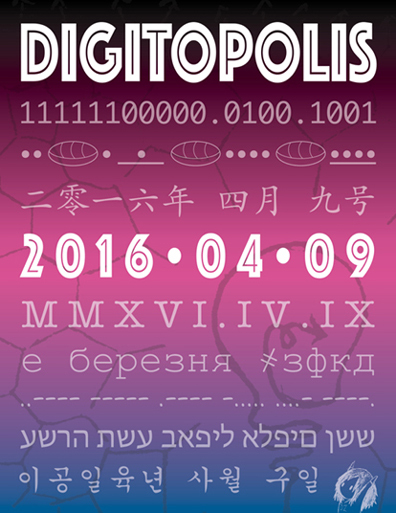 Digitopolis was not without its celebrities, including the King of Numbers himself. I speak, of course, of the Mathamagician. 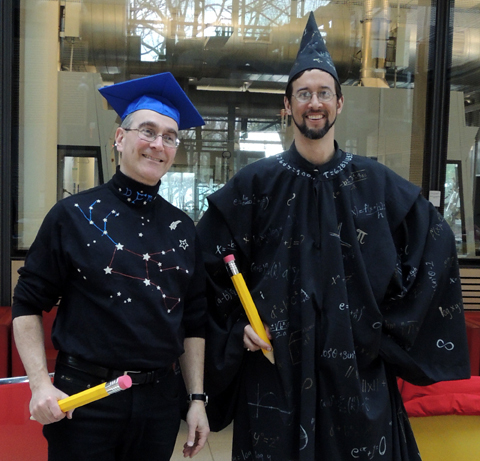 That’s real-life mathamagician Brent Ferguson on the right, grinning away under the pointy hat covered with equations. He’s math faculty at the Lawrenceville School, and in 2013, he was awarded the National Museum of Mathamatics’ Rosenthal Prize for innovation in math teaching. On the left is Dr. Dan Fishman, a high school math teacher, who, like Brent, has unbridled enthusiasm for all things math. Why do you like math? What’s the biggest number there is? Why does a negative times a negative equal a positive? What’s that crazy math thing with the exclamation point? Know any good math jokes? Brent and Dan brought a whole bunch of math toys and puzzles with them. It was an irresistible treasure trove of numerical goodies. 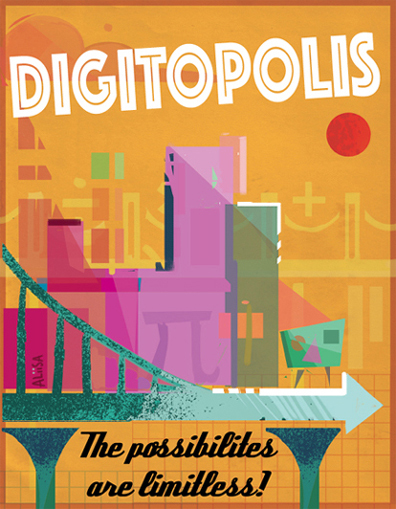 Also at the Mathamagican’s table were three Digitopolis “tourism” posters for families to take home (the posters were inspired by this fantastic NASA concept). The first two posters are by Princeton University senior, Aliisa Lee. The third poster is by freshman Demi Zhang. 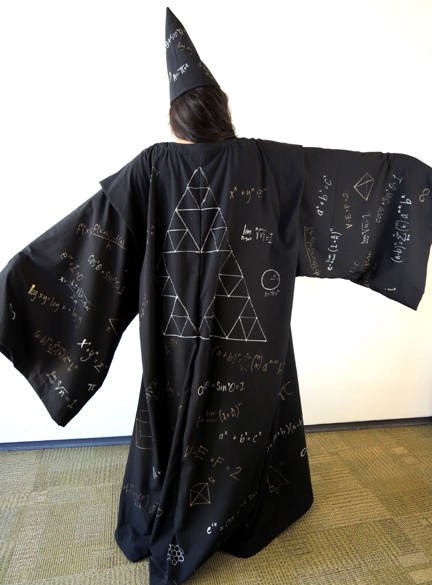 A quick word about the Mathamagician’s costume. The robes and hat were made by freshman James Jared, who ingeniously modified this Jedi robe. 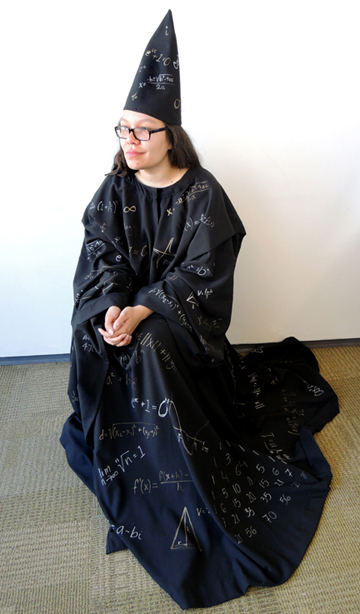 Then Casandra used silver and gold metallic fabric markers to draw real, honest-to-goodness math equations on them. We snapped a couple shots so you can get the full effect! The Mathamagician wasn’t the only celebrity in Digitopolis that day. Does this gentleman look familiar to you? Yup, it’s Albert Einstein. 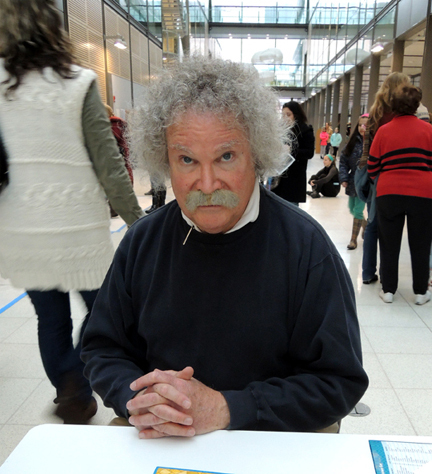 Or rather, professional reenactor Bill Agress playing Albert Einstein. Mr. Einstein circulated the event floor, chatted with kids, answered questions about his life and work, tried an activity or two, and posed for pictures. And yes – he wasn’t wearing any socks. In addition to being one of world’s most famous theoretical physicists (and no slouch at mathematics either), did you know that Einstein was a resident of Princeton? He emigrated here in 1933 to join the faculty of at the newly-created Institute for Advanced Study. 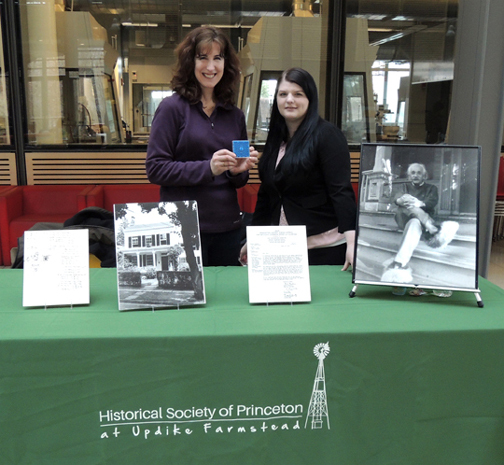 The Historical Society of Princeton put together a terrific mini-exhibit on Einstein in Princeton (my favorite is that photo of him wearing the fuzzy slippers). 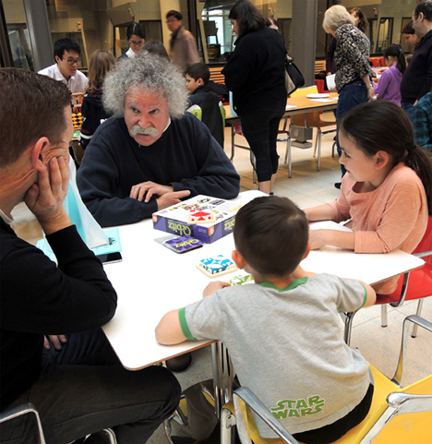 Families were invited to take home a map of notable Einstein haunts around town as well. They also whipped up an Einstein quiz for kids to try (the answers, by the way are B, A, B, C, B, C). The prize was a cool little puzzle. I found some terrific ones at Oriental Trading Company (the ones below are from the “Mind Teaser Game Assortment”). Elsewhere in Digitopolis, another math wizard was hard at work. 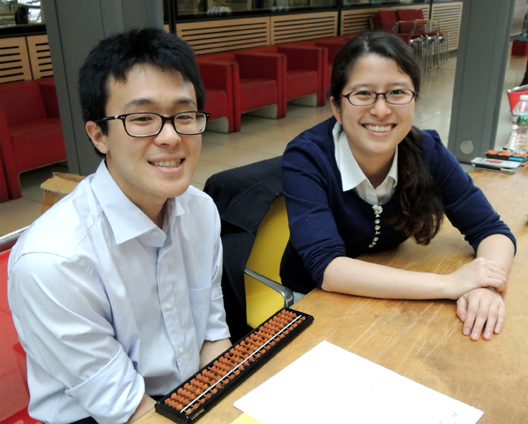 This is Emile Oshima, a junior at Princeton and master of the Japanese abacus. Next to him is senior Rei Mastsuura. 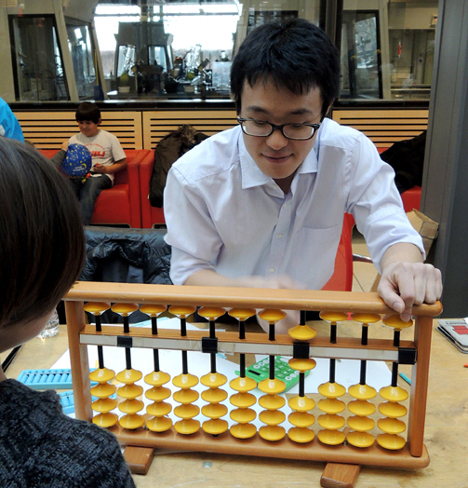 In addition to having Emile and Rei teaching kids how to use an abacus, Emile raced kids (and parents!) armed with electronic calculators to see who could reach the product of 3 x 3 multiplication problems faster. Emile always won. He was lightning fast! 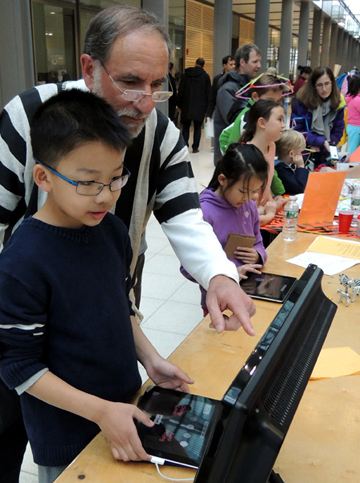 Meanwhile, at another event table, another calculator was keeping kids busy. But this calculator was rather…odd. 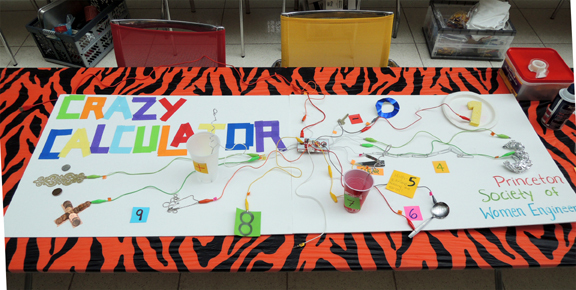 The “Crazy Calculator” was designed by the Princeton Society of Women Engineers using 2 Makey Makey sets. 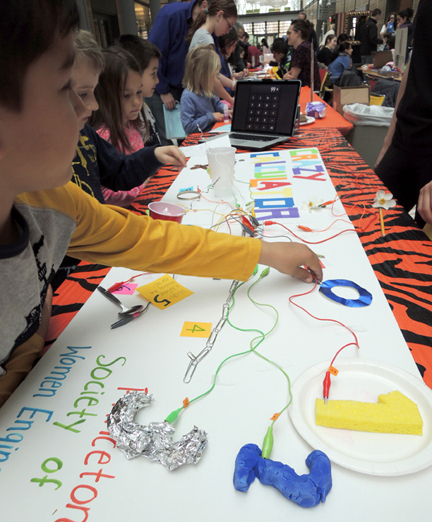 Have you seen Makey Makey? It’s pretty awesome. Each set consists of wired alligator clips, a small central board, and computer software. Attach the alligator clip to anything that conducts electricity, and you can do all sorts of crazy things. Turn bananas into a keyboard, or use Play-doe like a video game controller. The Women Engineers used all sorts of things to build their calculator – tin foil, wet sponges, water, metal objects, shaving cream, flowers, even high fives! 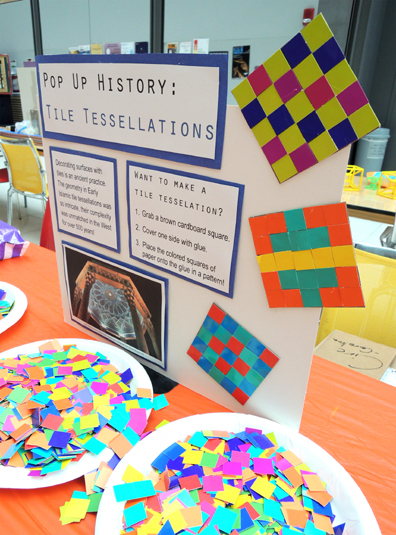 Interspersed with the other event tables were five “Pop Up History” activities that tied together math and history. These tables were designed to be simple, stand-alone, and un-staffed. 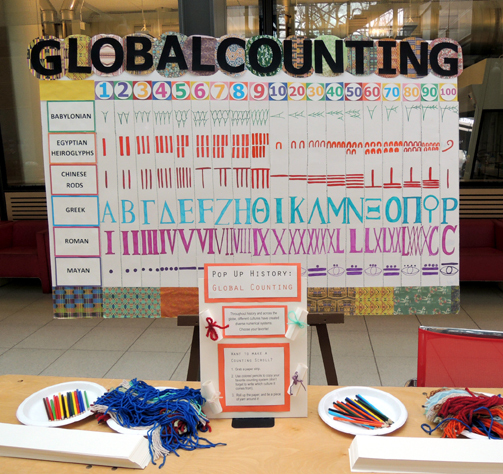 At “Global Counting,” kids could see diverse numerical systems on a big display board (the book Go Figure: A Totally Cool Book About Numbers (DK, 2005) was very helpful in this regard). 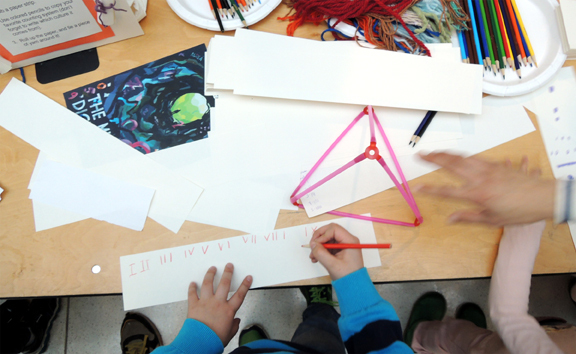 Then, kids copied their favorite number system on a 3.5″ x 17″ strip of paper, and used yarn to turn it into a little scroll. 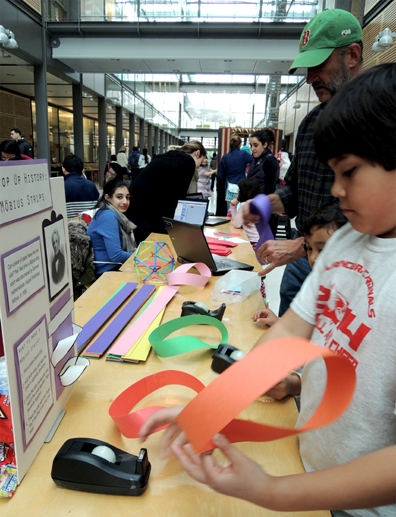 At another table were Möbius strips, a must-have for any hands-on math event. Discovered in 1858 by German mathematician August Ferdinand Möbius, the strip demonstrates how a piece of paper can have only one side! All it takes is a 2.5″ x 28″ piece of poster board, tape, and some instructions. 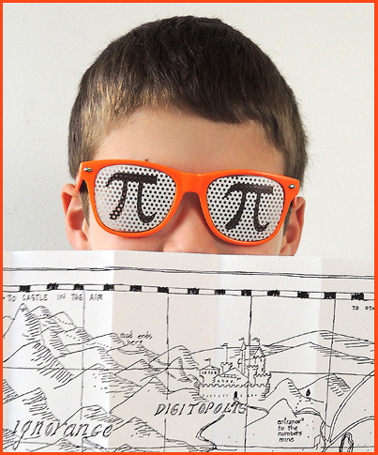 Another hands-on math must-have? Tangram puzzles. 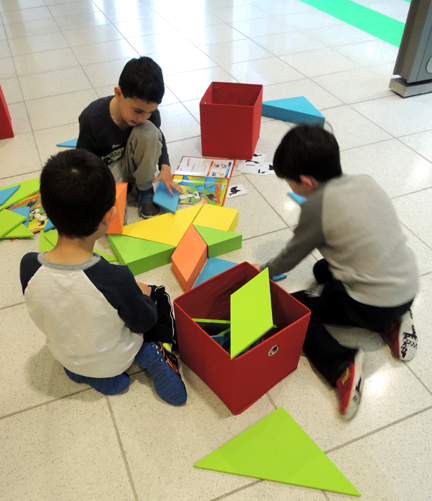 Originating in China, tangram puzzles were first introduced to Europe in the 19th century. There are plenty of inexpensive tabletop tangrams out there, but we decided to splurge on some giant foam floor size versions (thinner ones purchased from SimplyFun, chunkier ones from Fat Brain Toys). Later, these were donated to a local non-profit family shelter. 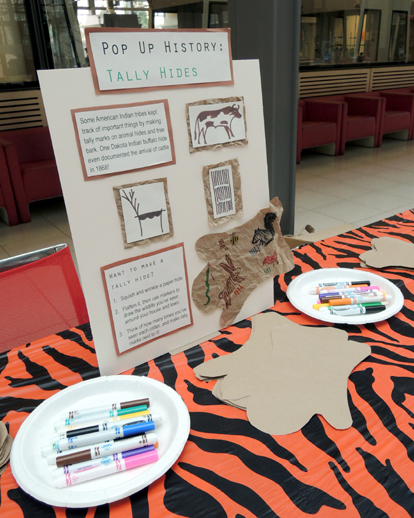 The fourth Pop Up History table was called “Tally Hides.” Some American Indian tribes kept track of important things by making tally marks on animal hides and tree bark. Definitely a cool way to count! 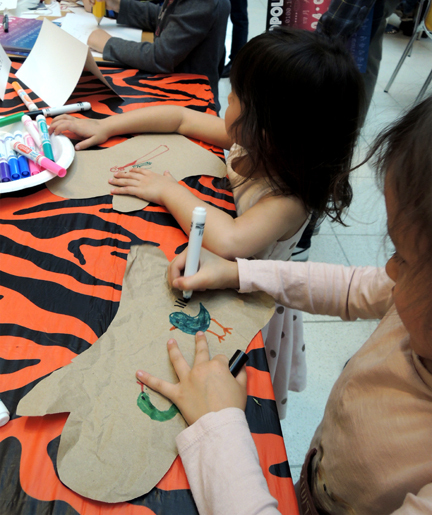 Before the event, we cut 9″ x 12″ pieces of brown paper into the shape of a hide. During the event, kids wrinkled the paper, flattened it out, and used markers to draw the wildlife they’ve seen around their homes and town. Then, they estimated how many times they’d seen each critter, and made a tally mark next to it. 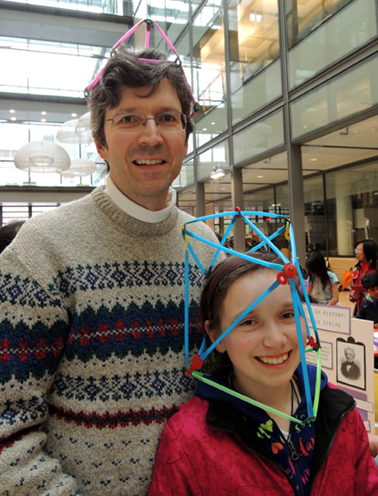 The project is originally from The Secret Life of Math (Williamson Books, 2005). The final history table was called “Tile Tessellations.” Decorating surfaces with tiles spans many cultures, and many centuries. But did you know that the geometry in Early Islamic art was so intricate, it was unrivaled for over 500 years? 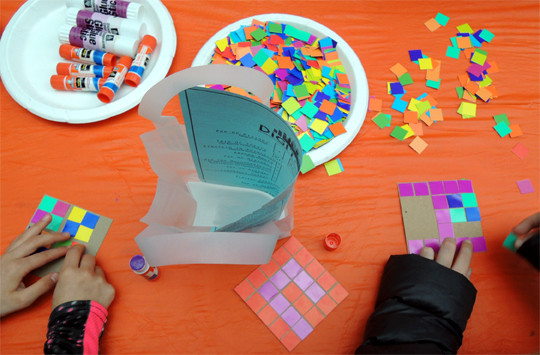 Kids put their tiling and tessellating skills to work by gluing 3/4″ paper tiles to a 6″ x 6″ square of tagboard. This project was really bright and beautiful. Or entire families could take a break and play Number Ninjas. Heck, maybe you could even beat Einstein at Qbitz! 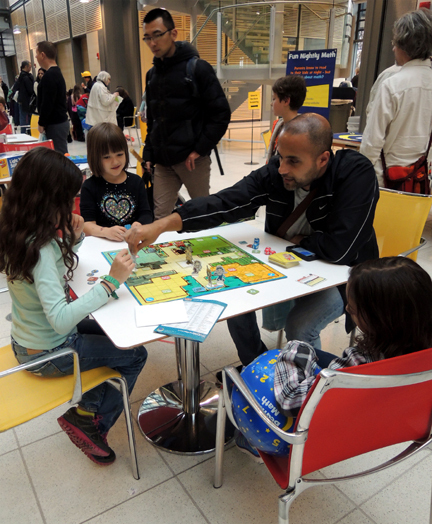 After the event, the games were donated to a local non-profit family shelter. For the musically adventurous, there was “Musical Fractions,” an activity composed by senior Matt Smith and freshman Demi Zhang. 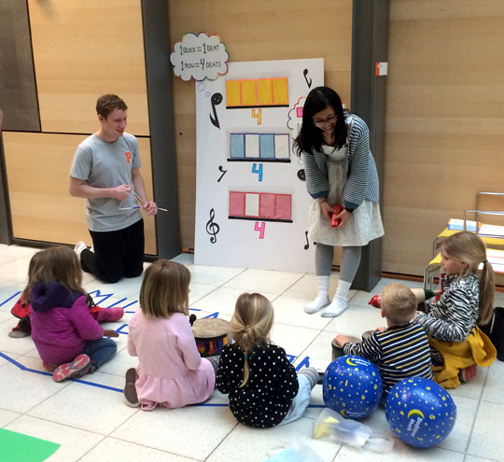 Kids used percussion instruments (assorted floor drums, wood blocks, maracas, a wooden fish, claves, and sand blocks) to learn how to play, and recognize, wholes, halves, quarters, and eighths. They also learned about musical structure and patterns. Each instructional session ranged between 10 to 15 minutes. I wasn’t able to catch an entire one, but I did manage to grab a few seconds of this one. Just listen to those fractions! I have one last thing to share with you. 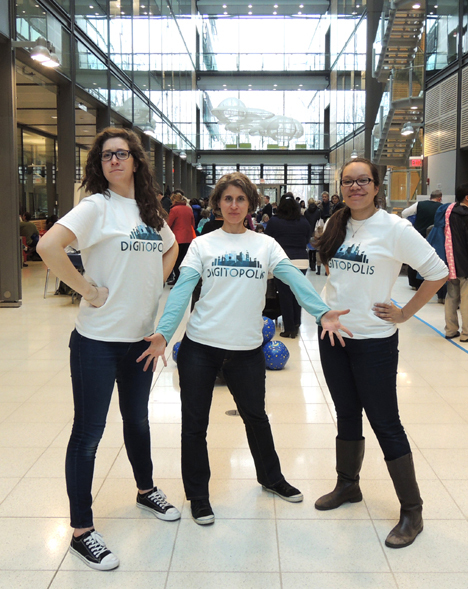 Team Digitopolis in their awesome event t-shirts. At big events like this, my staff and I wear costumes so that people can find us quickly in the crowds (helloooo Victorian Steampunk spelunker). 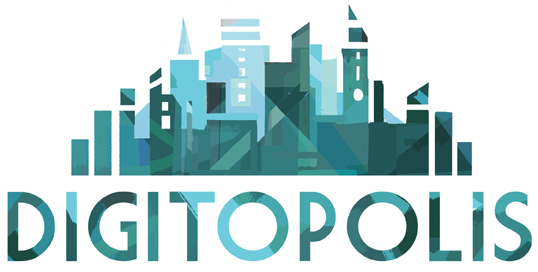 For Digitopolis, however, I decided to go with t-shirts, and asked student artist Aliisa Lee to design them. 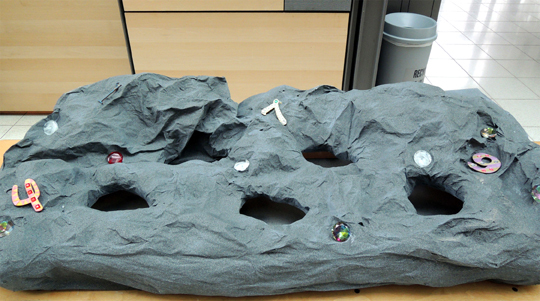 Here’s a closer look at her beautiful cityscape! 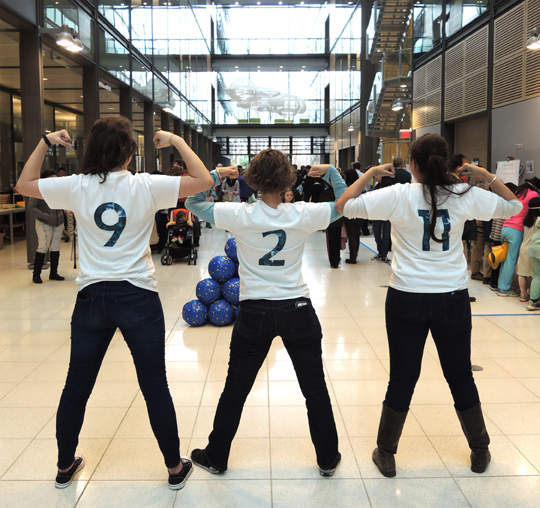 On the backs were our favorite numbers. Let’s hear it for 9, 2, and 11! Woot woot! I’d like to send a million, trillion, zillion, googolplex thanks to everyone who made this event possible, and who generously gave their time to make math fun, approachable, unusual and fun. An extra shout out to the Princeton University students, and the student athletes who volunteered so energetically and enthusiastically! Thank you so much, everyone! We’ve all wanted to jump into books. Who doesn’t, for example, want to go to Diagon Alley and hit the shops? Join Hazel for stories in the Honeycomb? Explore Babilonium with Candy Quackenbush? Or sail the skies with Matt Cruise on the Aurora? Part of my job at the Cotsen Children’s Library is to bring these places to life for kids, and this month, we headed to The Lands Beyond to visit Digitopolis, the mathematical kingdom in The Phantom Tollbooth. 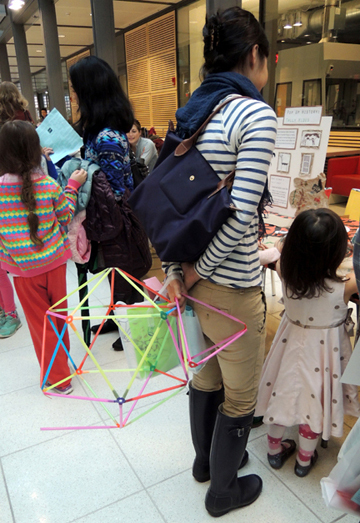 The math event was intended for children ages 4-10, and my goal was to make it full of exploration, demonstrations, games, challenges, and unexpected connections. And by the four million eight hundred and twenty-seven thousand six hundred fifty-nine hairs on my head, I think we did it! 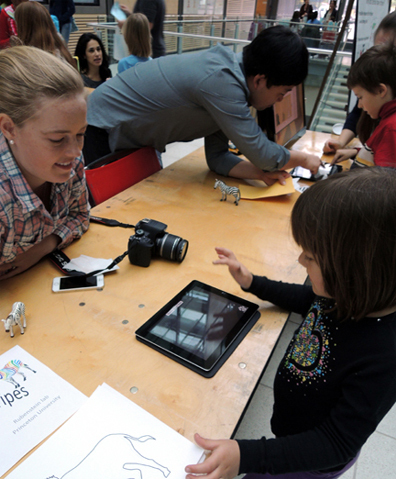 A Day in Digitopolis took place in the atrium of Princeton University’s Frick Chemistry Laboratory, a soaring, three-story structure of glass and metalwork. 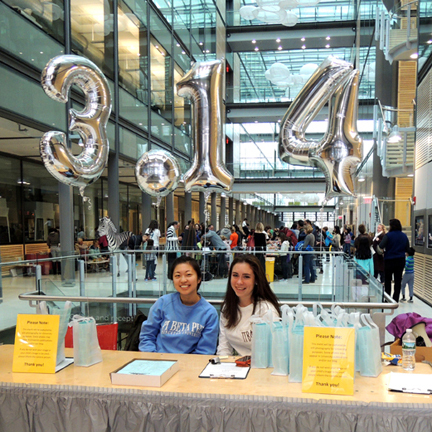 Here’s our welcome desk with two student volunteers and Pi balloons. But before I get started on all the details, I’d like to introduce our event collaborator, Bedtime Math. Founded by Laura Overdeck, Bedtime Math is a NJ-based nonprofit organization that provides playful, zany math problems for parents to do with their kids everyday. 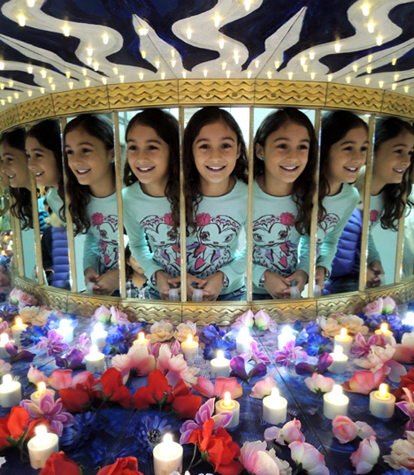 In addition to sharing their content through their books, e-mail, and free app, they created Crazy 8s, an after-school math club that has been launched in over 6,000 locations nationwide. These guys know, and love, math. And here’s Beach Ball Party, which involved counting, stacking, and chasing beach balls determined to make a break for it. 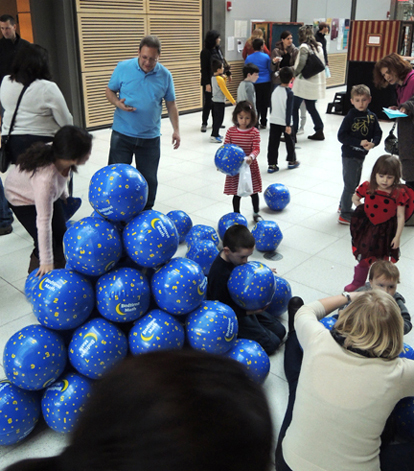 It also involved Ellen Williams (who you last spotted being pelted with marshmallows in this post) inflating dozens and dozens of beach balls for kids at the event. That’s her in the lower right corner of the photo, hard at work. Very impressive lungs has our Ellen (did I mention she sings in multiple choirs?). 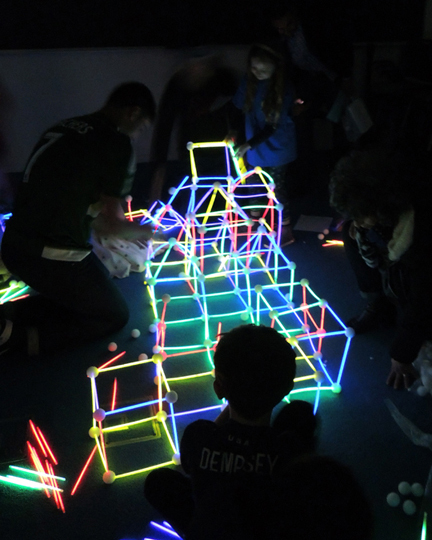 But the total show stopper was Bedtime Math’s Glow-in-the-Dark Geometry. This took place in a darkened classroom off the main event floor. 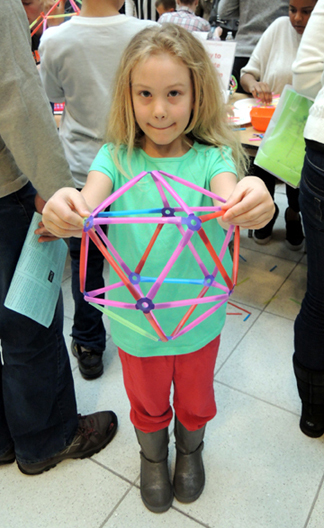 Here, kids could build illuminated structures with glow stick bracelets and styrofoam balls. The results were totally amazing. Some kids decided to use the original plastic connectors that came with the bracelets to make unique geometric creations. Here’s one of my favorites. A series of loops that, when spun, becomes a sphere! Bedtime Math was recently invited to the White House to take part in an early STEM learning summit. Seriously. 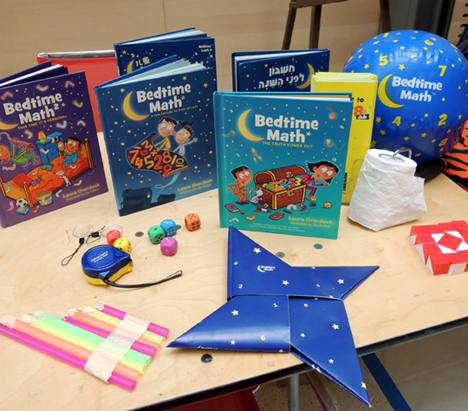 When it comes to amazing math connections for kids, Bedtime Math has it down! 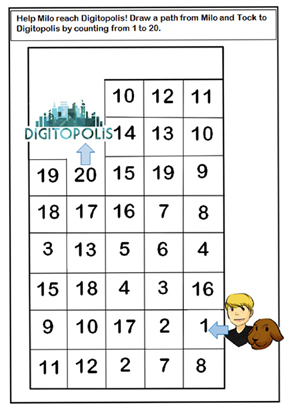 Moving to a different section of the event floor, we find the fabled number mines of Digitopolis. 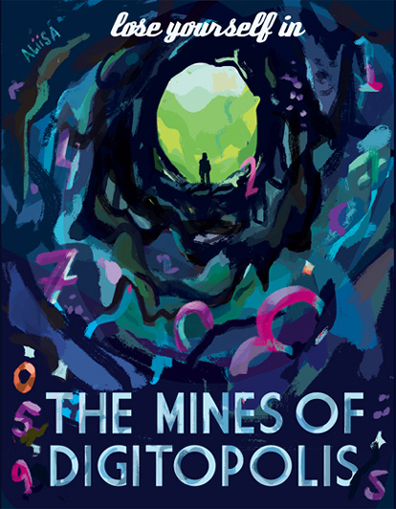 In the book, Milo, Tock, and the Humbug learn that numbers are, in fact, excavated out of the earth, much like jewels and precious stones. The talented Maria Evans from the Arts Council of Princeton built the mine you see below, but we built another one for a later event. You can find the step-by-step instructions here. The mines were stocked with an assortment of wooden numbers. I used 4″ numbers I found online at Woodcrafter. If you’d like a cheaper option, I recommend printing paper numbers on card stock. 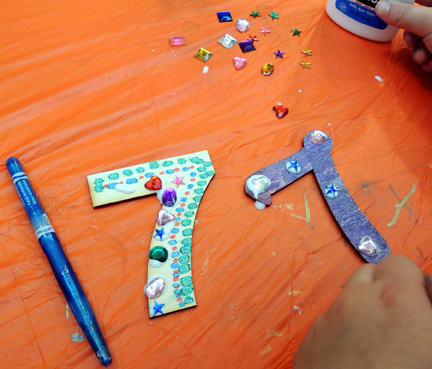 At the event table, kids reached into the mine, extracted a number, and then decorated it with a combination of metallic markers and glitter markers. 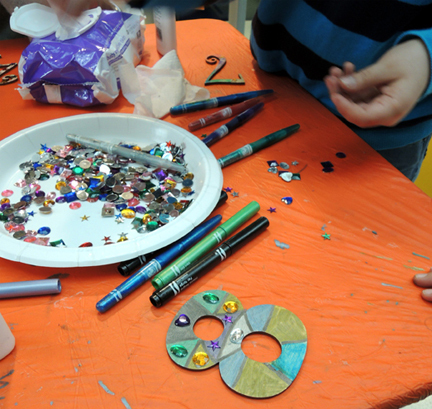 We also had plastic gems and glue on hand for some additional bling. 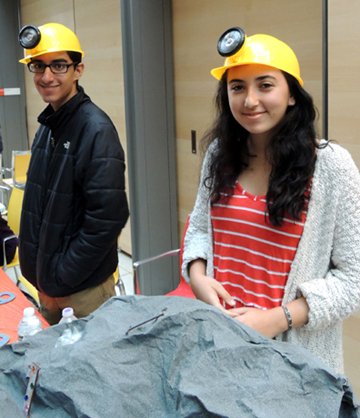 The mines were staffed by high school volunteers from the Arts Council, who were suitably decked out in miner helmets. 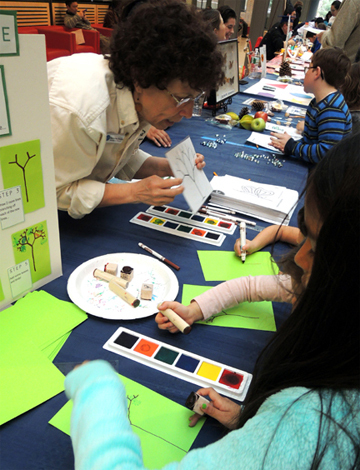 Elsewhere in Digitopolis was the “Fibonacci Forest,” hosted by the Stony Brook-Millstone Watershed Association. 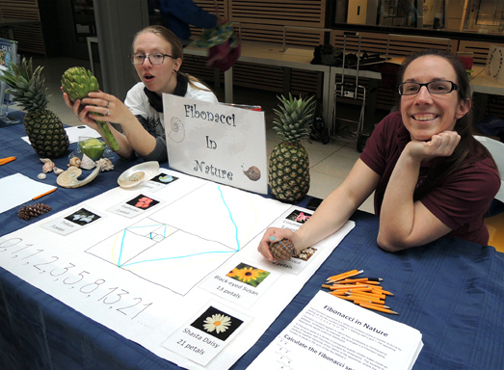 This table focused on math in nature. Specifically, symmetry, shapes (like spheres, hexagons, spirals), fractals, and Fibonacci numbers. 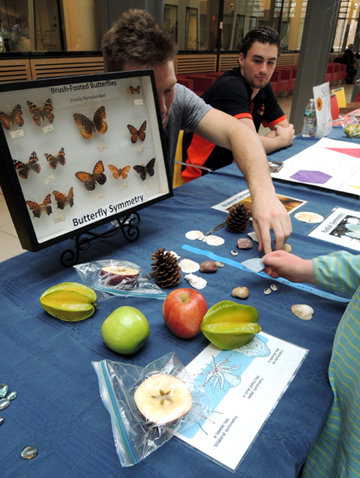 The Watershed brought a ton of items for kids to touch, connect with, and explore (including my personal favorite, a gorgeous nautilus shell). 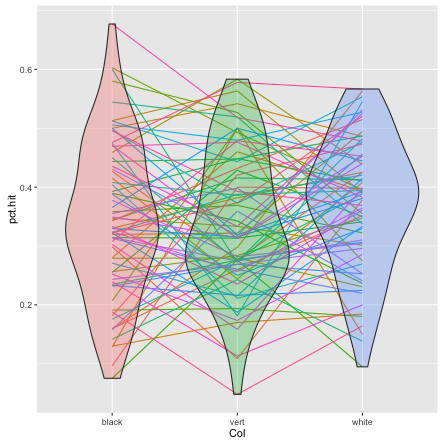 The Watershed also did a cool fractal tree project. It involved a half-sheet of green paper, brown markers, and rulers (here are the instructions if you’d like to see them). 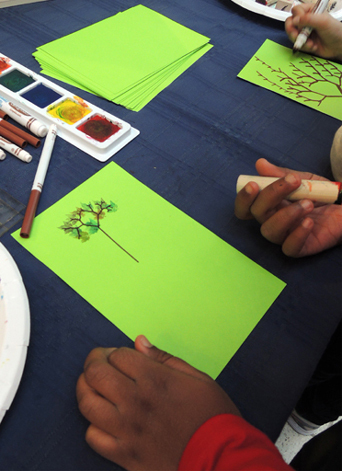 We decorated the finished fractal trees with bird and leaf stamps, but you can also just use markers or color pencils. And speaking of wildlife, how about some zebra math? We were delighted to be joined by Princeton University Professor Dan Rubenstein from the Department of Ecology and Evolutionary Biology. Among other things, Dan does field work with African zebras. Some researchers believe that zebra stripes exist to confuse predators. So Dan and his constituents developed “Dazzle Confusion,” an iPad game in which kids “become the lion” and tried to tap black, white, or striped moving targets to determine which one is most difficult to hit. At the end of the game, the program tabulated the kids’ results and displayed them on a large screen. 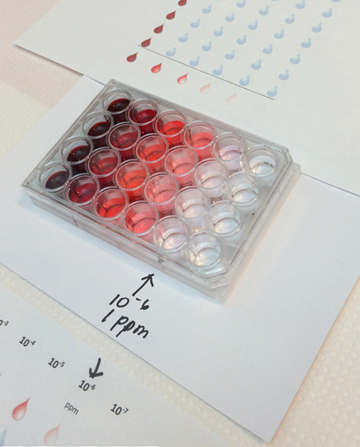 As the event progressed, the results continued to accrue. This lead to conversations about data collection, measurement, central tendencies, and averages. It’s worth noting that although there was much variation on kids’ “strikes” on the targets, there was a strong trend (p < .08) showing that the striped targets were hardest to hit! How’s that for some real world math? 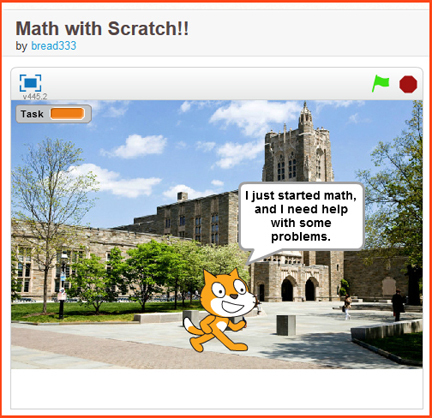 Continuing with the technology theme, the Princeton Women in Computer Science designed an original math game for kids using Scratch, a visual programming language developed by MIT. Here’s a screen shot of the game, which was created by sophmore Lucy Lin. If you’d like to test drive the game yourself, here’s the link. 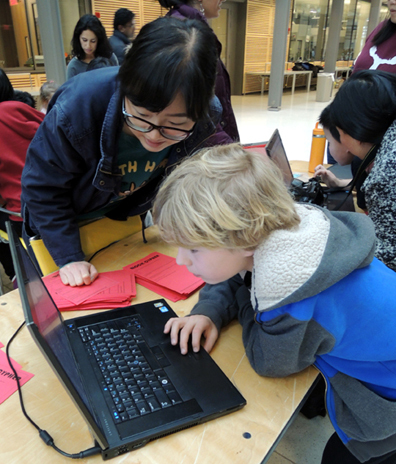 The game was cool, but even cooler was the fact that there was another laptop running tandem to the gaming laptops that showed all the algorithms behind the Scratch program. And volunteers were on hand to answer any and all questions about computing. 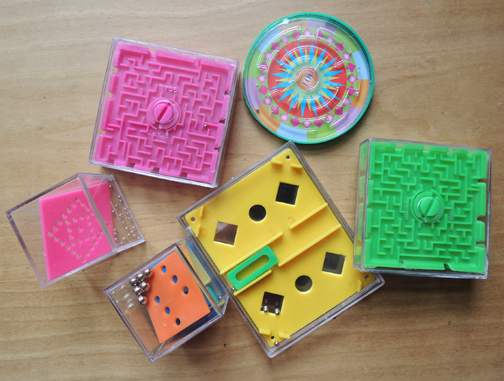 They also had a couple of encryption puzzles for kids to crack. 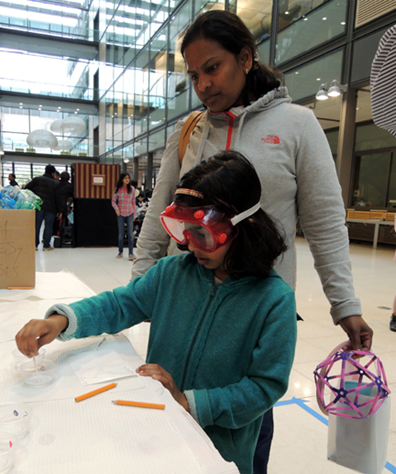 Meanwhile, the Princeton Chemistry Outreach Program (we’ve exploded things with these guys before) was busy making awesome math / science connections with kids. 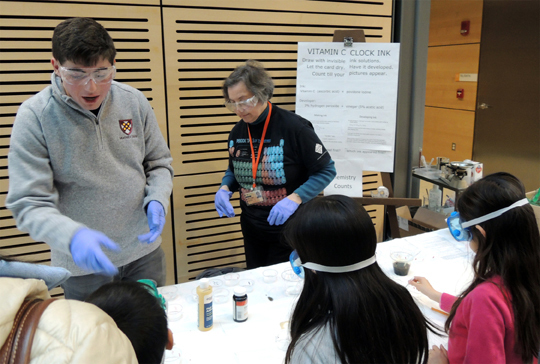 Dr. Wagner and her students ran hands-on experiments with parts per million, vitamin c clocks, and timed invisible ink. 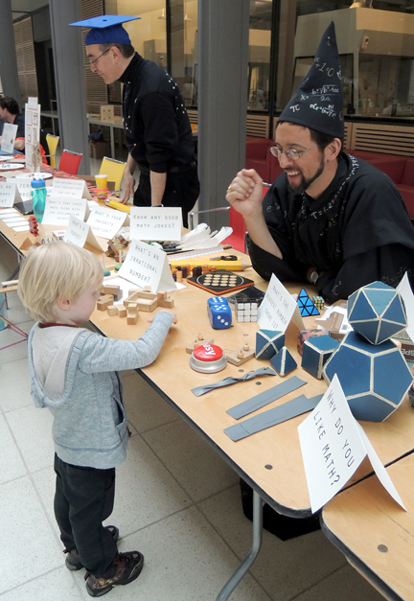 For those who prefer their math undiluted, the Princeton University Mathematics Club came out en force to host a “Playful Problems” table. 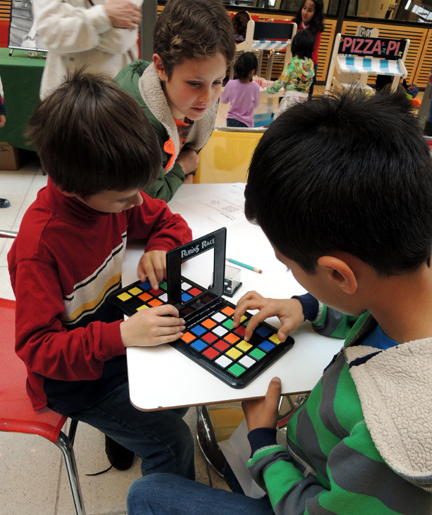 Here, kids found a plethora of logic puzzles, word problems, visual puzzles, calculator tricks, the works! 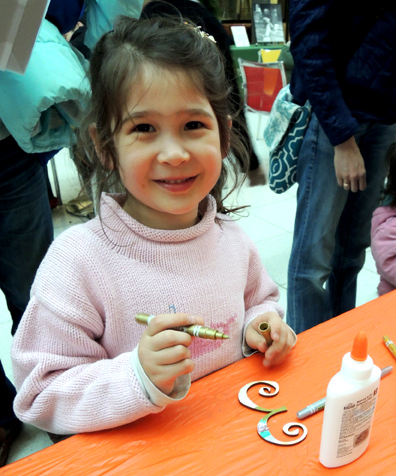 There were 12 different activities for children ages 4-10. The activities ranged from easy to moderately difficult. Here’s an example of our simplest puzzle, which was created by Casandra Monroe (whom you first met here). Here’s the template if you’d like it. Below is a list of what we offered at the event table. In addition to using Google to find some of these puzzles, Math Wizardry for Kids (Barron’s, 1995) and How to be a Math Genius (DK Children, 2012) were terrific resources. Important! If you put together your own Playful Problems table, make sure you provide an answer sheet for each problem. 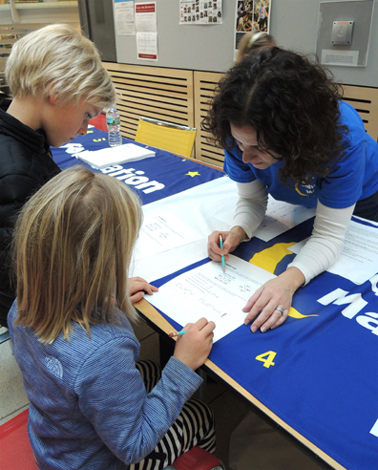 That way, parents and kids can check their answers or get a little hint. Also important! No matter how easy the puzzle, provide an answer sheet (you don’t want younger kids to think that their puzzle was too “easy” for a solution sheet). For those wanting a bit a exercise with their mathematics, we had a giant 16′ x 16′ floor maze (building instructions for it are in this post). 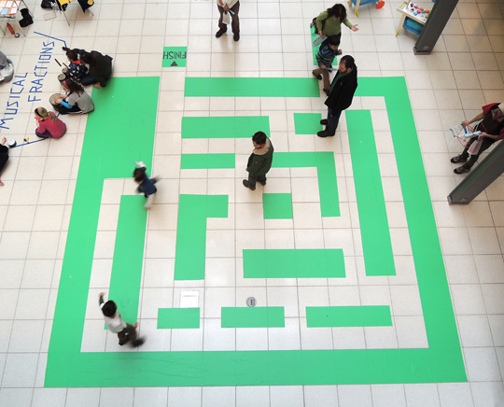 Kids had to get from start to finish in the maze – without making a single right-hand turn. If you got stuck, the solution was posted on some glass doors opposite the entry to the maze. I always try to include something for the littlest patrons, so I bought 3 adorable food carts and stocked them with math play sets. 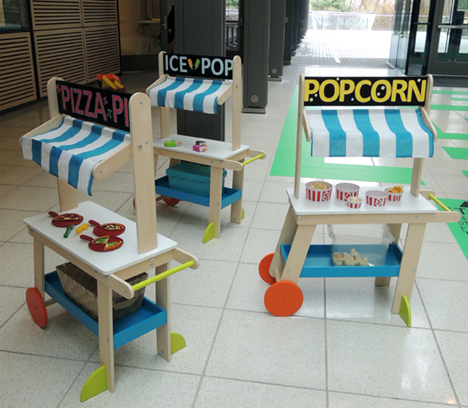 The food carts are by KidKraft (Sweet & Sunny Lemonade Stand) and the play sets are by Learning Resources. We used Piece-A-Pizza Fractions, Number Pops, and Count ‘Em Up Popcorn. And, because little kids love to take things in and out of containers, I bought a fabric basket for the pizza cart, a plastic box with a hinged lid for the ice pop cart, and a clear container for the popcorn cart. 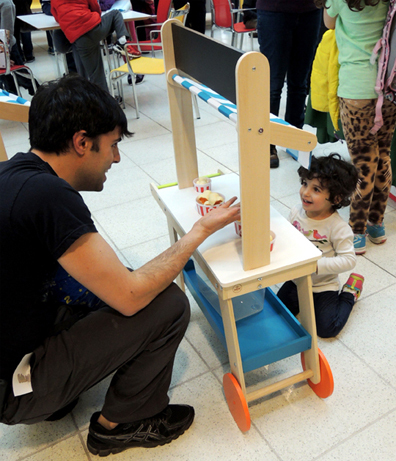 After the event, we donated the carts and math sets to a local non-profit preschool. 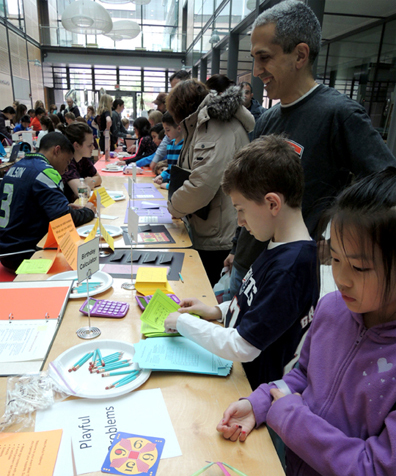 One of the most popular event tables, however, was “Visit the 4th Dimension.” It was hosted by scienceSeeds (whom you first met here, and then again here). 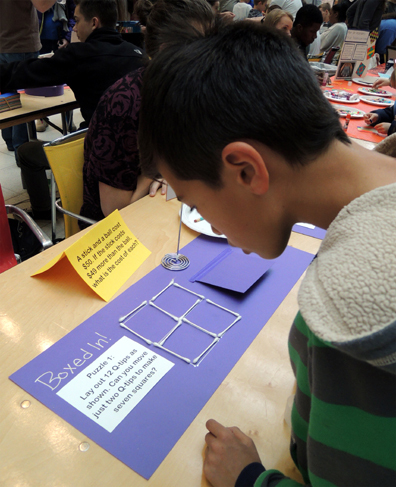 At the event table, kids learned about the different dimensions (1st is a line, 2nd is a square, 3rd is a cube, 4th is a tesseract). 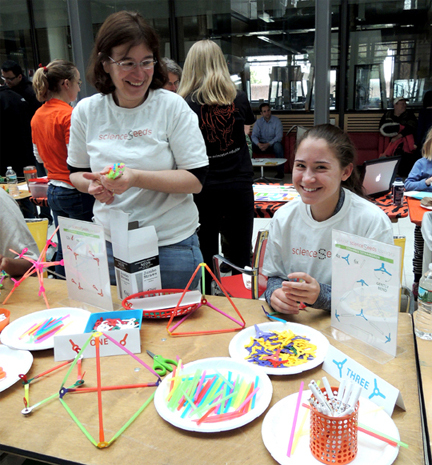 ScienceSeeds brought their 3D printers to the event and made models. You can see a tesseract in progress below. Awesome. 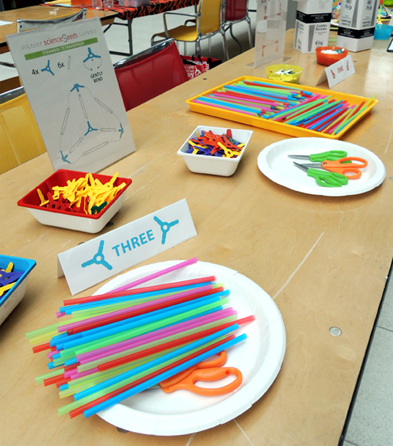 Kids could also make 3D models of their own using drinking straws and plastic connectors. You can buy the plastic connectors online (from Strawbees). 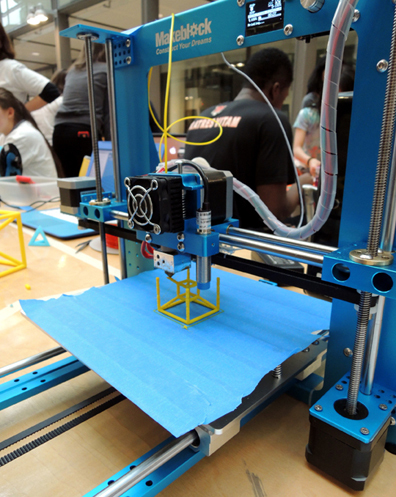 However, scienceSeeds has a die cut machine and was able to purchase the die cuts (from Accucut) and make their own connectors from plastic sheets (from Grafix). 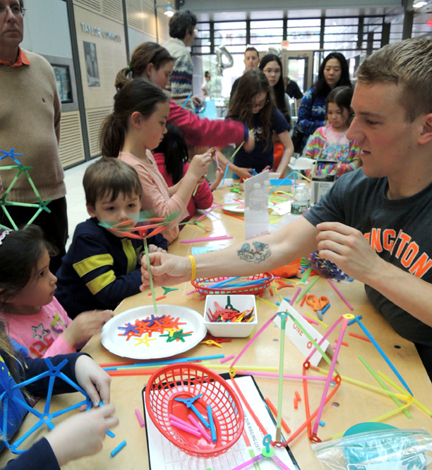 Like I said, their table was hopping – they estimate they went through at least 3,500 straws! The thing I liked most about the project is that there was no limit to the shape, size, or intended use of the 3D models. 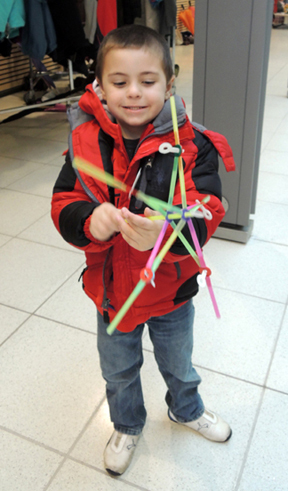 If plastic connectors are not in your budget, I’ve seen similar activities that used straws and pipe cleaner pieces (like this one), or sculptures that that involved cutting and sliding the ends of bendy straws into one another (like this one). 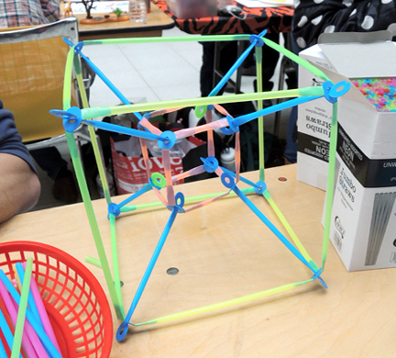 I’ve also seen toothpick and marshmallow, (or toothpick and gum drop) geometric structures. But I tend to avoid those because of food allergies.